Hello and welcome back! 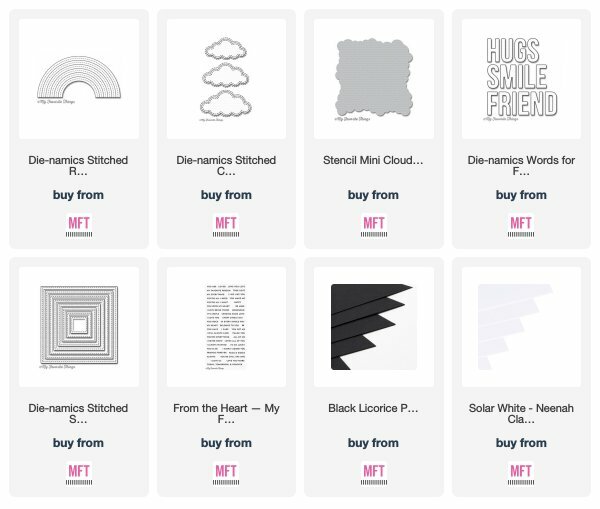 Today I have a card to share for the newest MFT Sketch Challenge. I love the grid design on the sketch and decided to create a sky of inked clouds before trimming it into 4 separate squares. To cut the squares, I used the Stitched Square STAX so I would have a fun stitched design on the outer edge of the squares. 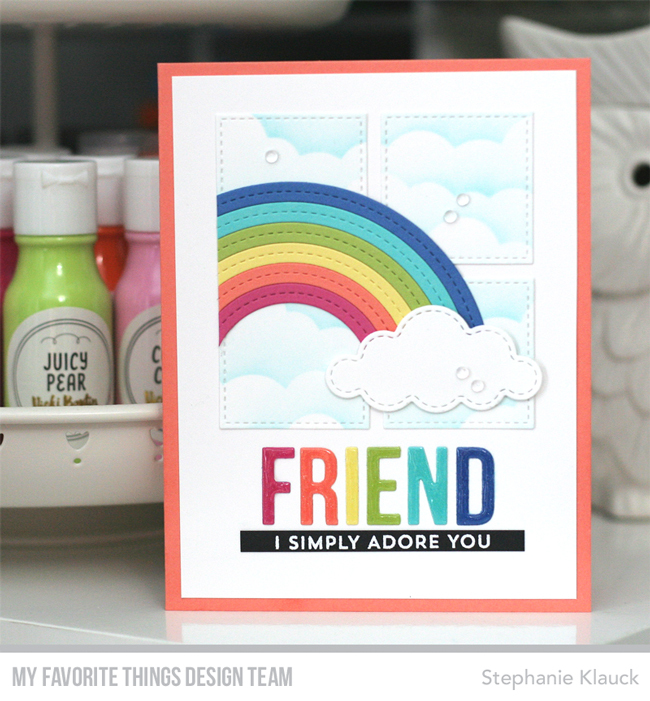 Once I had the clouds in place I created a card stock rainbow using my current favourite rainbow colour combination - Ripe Raspberry, Coral Crush, Banana Split, Sour Apple, Blu Raspberry and Cornflower. 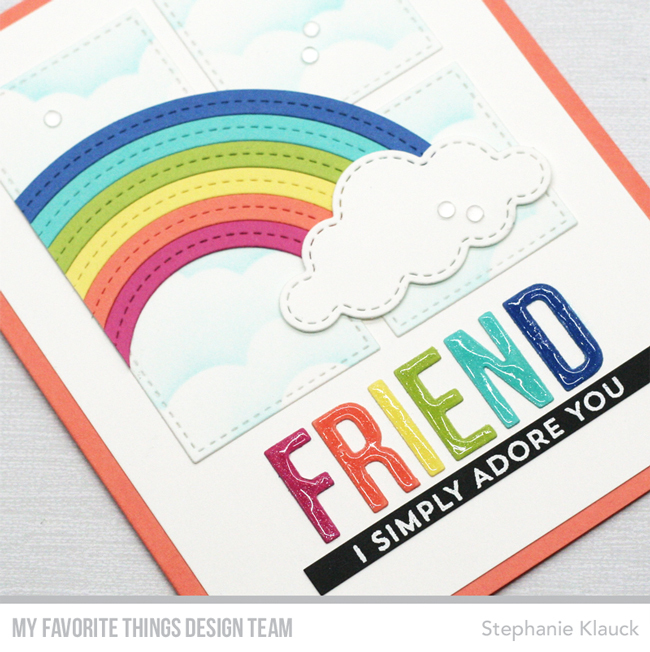 I also wanted to include the rainbow colours in the sentiment so I die cut the word friend using the same colours and then I adhered them to the card front in rainbow order. I stamped a sentiment from the From the Heart stamp set onto a thin strip of black card stock and I heat embossed it with white embossing powder. I trimmer it down so it would fit under the larger die cut word and then I added the completed panel to a Coral Crush card base. I also added sparkle to the letters with my Nuvo glitter pen and then I covered each of the letters with Nuvo Crystal Glaze for added shine and dimension. You can see more cards using this week's sketch and enter your own at the Challenge blog here. I love the shiny Friend!